The fourteenth and final Prestige Set honored the United States Botanic Garden located near the United States Capitol on the National Mall in Washington, D.C. Nearly as old as the city of Washington D.C., the United States Botanic Garden fulfilled George Washington's dream of gardens that would demonstrate the importance of plants to our lives and livelihoods. Garden equals green (or it should), therefore the Mint chose green for the packaging of the 1997 Prestige Set. They continued the same design for the packaging with the lidded box dimensions of 5 1/4 inches by 7 3/8 inches by 1 5/8 inches. 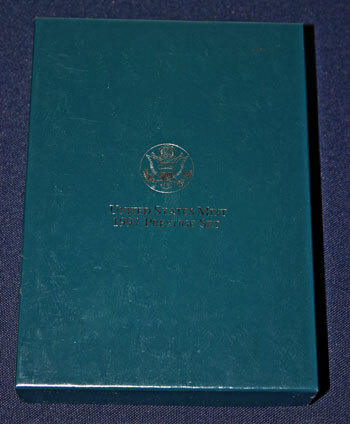 Like earlier sets, the box lid contains the heraldic eagle emblem in silver printed above "UNITED STATES MINT 1997 PRESTIGE SET." Inside the two-piece box, the padded, plush velvet book and the Certificate of Authenticity printed on a greenish hued paper fit securely. The metallic heraldic eagle emblem is centered on the front of the green plush velvet book. Metal brackets protect the velvet corners of the coin book. Opening the front cover displays the six coins on the right held securely and sandwiched between two pieces of clear acrylic. The commemorative silver dollar takes pride of prominence at the top of the coins. 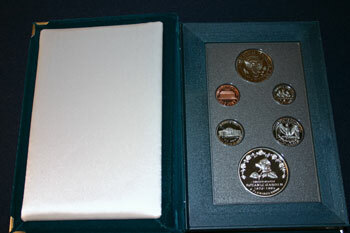 The five standard proof coins are positioned below the commemorative silver dollar. The six coins' face value equals $1.91. The Mint's initial issue price was $57. In 2010 money, the same amount would be $77.29 using the Bureau of Labor Statistics' Inflation Calculator. Inside the front cover, a white, shiny fabric covers heavy padding. 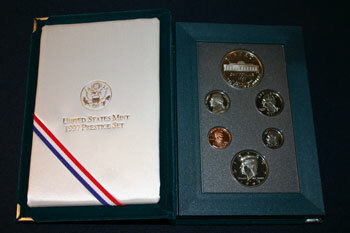 The heraldic eagle emblem is printed in silver over the inscription "UNITED STATES MINT 1997 PRESTIGE SET." In the lower left corner, a red, white and blue ribbon attaches across the corner to form a triangle. 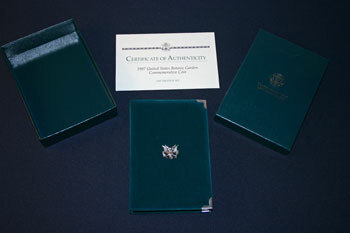 The ribbon can be used to hold the Certificate of Authenticity inside the coin book. Turning the set over to view the coins' reverse, the inside back book cover is padded and covered with white, shiney fabric. The fabric and padding protects the clear acrylic cover over the coins. 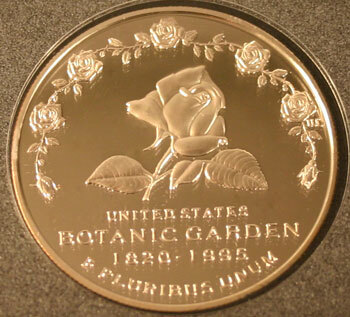 As the Director of the Mint stated, sales of the Botanic Garden commemorative coin helped fund the mission and projects of the United States Botanic Garden. Today, their mission states, "The United States Botanic Garden is an institution dedicated to demonstrating the aesthetic, cultural, economic, therapeutic, and ecological importance of plants to the well-being of humankind." The obverse of the commemorative silver dollar shows the facade of the United States Botanic Garden Conservatory. As US Botanic Garden web site proclaims, the Conservatory is a window to the world. The historic greenhouse contains 28,944 square feet of growing space in eight garden rooms. In 1997, the Conservatory closed for four years in order to dismantle and rebuild the historic greenhouse for the 21st century. On the coin above the Conservatory, "LIBERTY" curves across the top rim. 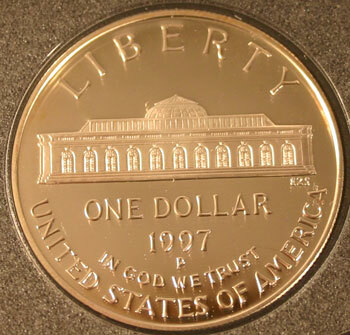 Below the greenhouse, "ONE DOLLAR," "1997," "IN GOD WE TRUST," and "UNITED STATES OF AMERICA" are inscribed. On the reverse, the designer placed a beautiful rose in the middle of unfurling in bloom underneath a garlard of roses in full bloom. Under the rose, the inscriptions say, "UNITED STATES BOTANIC GARDEN 1820 -1995" and "E PLURIBUS UNUM." To this day, the Botanic Garden is owned by the people and is the Nation's garden. Admission continues to be free to see the many "living treasures of the world" on display in the garden and the conservatory.